The shoddy state of the Australian Navy's frontline fighting ships, despite a billion dollar upgrade, is due to years of neglect by the Howard government, Defense Minister Joel Fitzgibbon has said. Fitzgibbon told the Australian Broadcasting Corporation that the previous government's claim to be strong on national security was misleading and that the new Labor government—elected in November 2007—had inherited a number of "nightmare" defense projects. The minister said he was particularly concerned over the legacy left by the Howard government on defense maintenance. "I have very serious concerns and this is just one of a number of projects which we are now learning in government are going to be a real problem for the new government," Fitzgibbon said. "But we're determined to work sensibly through them and deliver the Navy and indeed all the services the level of capability they need or require to adequately defend the nation." Fitzgibbon slammed the previous government over their neglect and said the new Rudd government was now committed to working hard to restore the state of the nation's defense resources. "The former Howard government managed to portray itself as a government very confident in the area of national security but unfortunately we are learning in the very early days of [the Rudd] government that the reality is something very, very much different," Fitzgibbon said. "The important thing is that we're determined to get value for taxpayers' money and we're determined to deliver the Navy and other services the capability they need," he said. "These are significant nightmares we've inherited, but we're determined to set them right." Fitzgibbon's claim comes as a source close to the Navy revealed to News Ltd. newspapers earlier this month that the $1.5-billion frigate upgrade project undertaken by the Howard government in 1997 was a failure, resulting in the 1970's-constructed frigates still being unusable. The source revealed that the complex electronic systems on board the 4,000-ton Adelaide Class Guided Missile Frigates did not function properly, rendering the vessel virtually "blind." 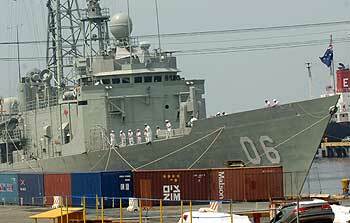 News Ltd. reported that navy commanders had labeled the Howard government's upgrade as a "debacle" with the frigates unable to be sent into a war zone due to the problems regarding the electronic systems. Fitzgibbon said the thinking behind the upgrade of such an old vessel was flawed. "Trying to make a 21st-century warship out of such an old vessel always carried very significant risks," he said. However, Opposition defense spokesman Nick Minchin hit back at the criticism admitting that, while the update had not been carried out on time, this was due to difficulties inherited by the Howard government's predecessor. "It is a legacy but a legacy of procedural contractual systems inherited from Labor," Senator Minchin told The Australian last week. "It's well known this contract has been running behind schedule. It's now up to [contractor] Thales to make sure it works with the Defense Department to bring these ships up to operational capability." The new Rudd government has reportedly asked defense commanders to compile a "hit list" of the previous government's defense contracts that have failed or are likely to fail. View the Worldpress Desk’s profile for Rich Bowden.